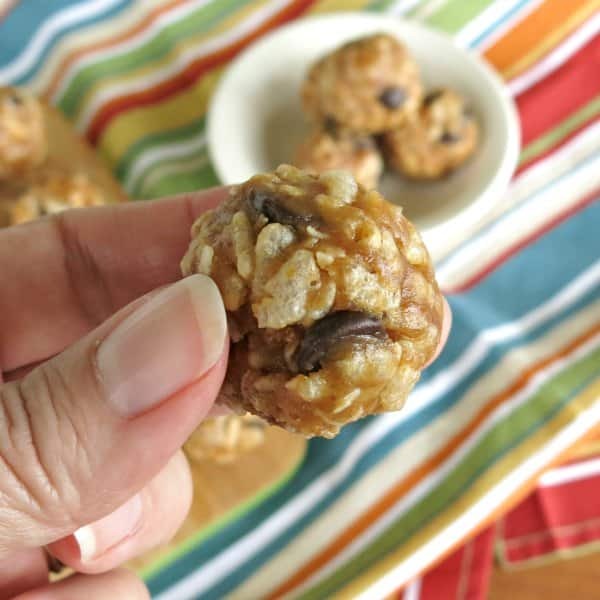 It’s the incredible CRUNCH that makes these no-bake Date Balls with Rice Krispies stand out in a crowd! We love energy balls for snacking and as an after-dinner sweet…and now we choose which ones to make based upon the texture! 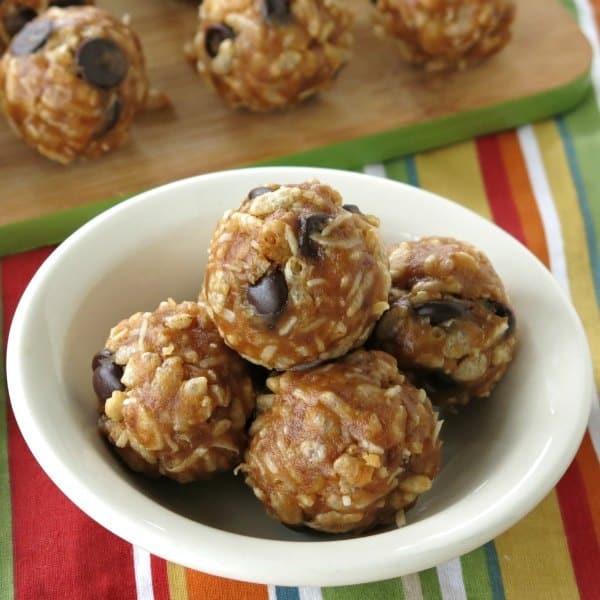 For a smooth and fudge-like treat, we make Energy Balls with Medjool Dates. Or, when in need of a chocolate fix, we make Chocolate Date Balls instead. Carrot Cake Balls have a delicate, cake-like texture that are perfect for parties and Spring. Our newest obsession is date balls made with puffed rice cereal because of the crispy, crackly satisfaction you get with each and every bite! They are vegan, gluten-free and absolutely delicious! Medjool dates or date paste. Check out How to Make Date Paste and keep a jar in the fridge so you can whip up protein balls and other baked goods quickly and easily. 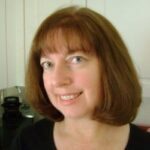 Almond butter – peanut butter, nut butter, and sunflower seed butter works equally well. Puffed rice cereal – as in the cereal you would find at the grocery store. We opt for a brown rice variety with as little sweetener as possible. Want to make your owned Puffed Rice? Check out this video by Flavor Lab. Chocolate chips – use mini chocolate chips for maximum dispersion throughout the batter. We used dark chocolate chips. To make the date paste, soften Medjool dates in hot water. Remove dates from the water and puree them in a food processor with a little of the water they soaked in. Make the paste as smooth as you would like! It does not have to be perfectly smooth, but it can be. Cream date paste with almond butter and vanilla extract. Add puffed rice cereal and coconut flakes and stir to combine. The batter should hold together and not be too wet. If it’s too “sticky” to work with then refrigerate it for about 10 minutes. If that doesn’t work, add a few more Tablespoons of puffed rice cereal. Shape into balls and enjoy! 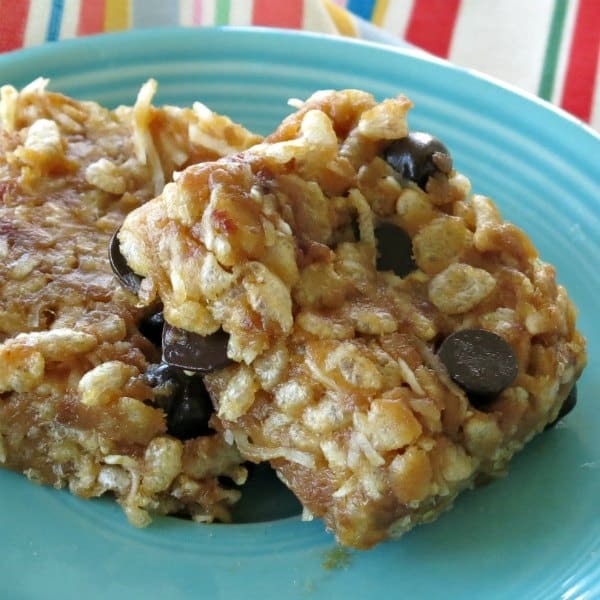 Variation to try: Spread the almond butter rice krispies batter into a baking dish, refrigerate and cut into squares. Store date balls in the refrigerator in an air-tight container for 1 week. Or, freeze in a single layer and then transfer to a resealable freezer bag and store in the freezer for up to 2 months. Date Balls with Rice Krispies and coconut shreds have a crispy, crackly crunch. Add dates to water, cover with plastic wrap and set aside for 5-10 minutes. This softens the dates and makes them easier to puree. Remove dates from water and place them in a small food processor along with 1 Tablespoon of water that the dates soaked in. Scrape date paste into a large bowl. Add almond butter and vanilla extract and stir to combine. Add puffed rice cereal and coconut flakes to the bowl and stir until thoroughly incorporated. 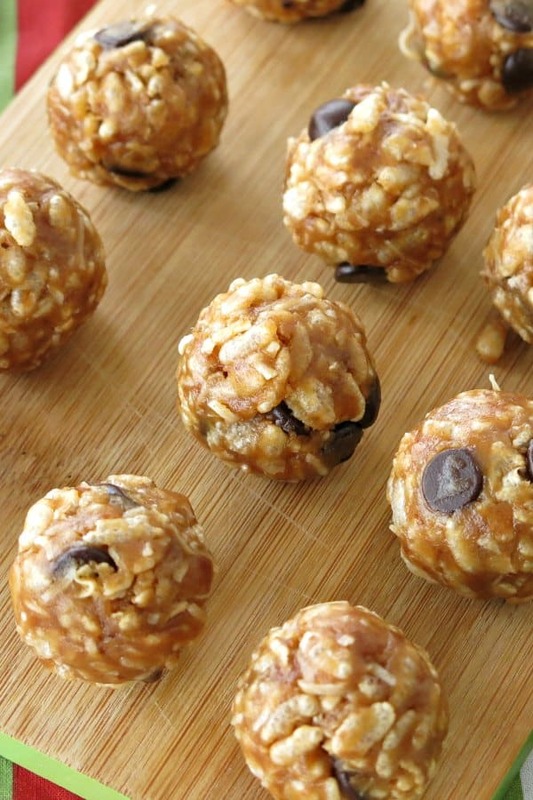 Form dough into Tablespoon-size balls and enjoy! Store date balls with rice krispies in the refrigerator or freezer. Everything I love in one little energy ball! 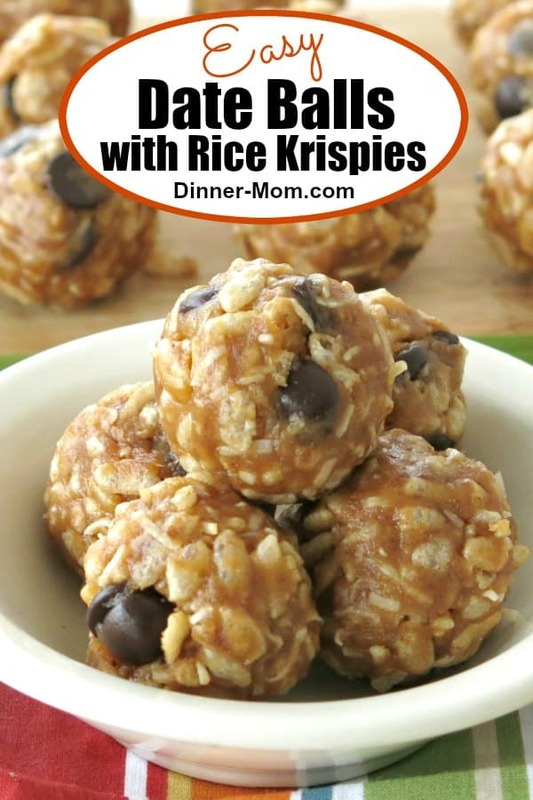 These look fantastic and I love that you added the crunch with the rice krispies. We tend to gravitate towards these in mid-afternoon to get over that midday slump. Thanks Linda…it’s a favorite afternoon snack at my house too! Such a tasty treat! Love these! I love this recipe and I already have all the ingredients to make it again! I love having these on hand for a little treat during the day!